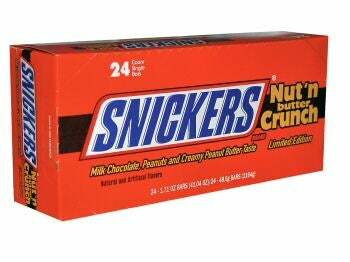 Unlike those "evolve-or-die" candies (I'm looking at you, various flavors of Kit Kat), Snickers has remained pretty steady throughout the years. It's the old peanut-farting grandpappy of the candy aisle, perfectly reliable and damn tasty on occasion. Also, since it's packed with peanuts, it generally satisfies, or so I hear. But even Snickers has jumped on the side-project bandwagon recently, with the strangely disappointing Snickers Dark and now, the clearly named-by-committeee Nut'n Butter Crunch. The idea here, I think, is that it's a Snickers with peanut butter in place of the usual nougat, and minus the caramel. And the wrapper is red. And it says "limited edition," so you can totally sell one of these on eBay in a few years. Taste: Instead of the gooey peanut butter I was for some reason expecting, SNnBC (the kids call it "sninbuck!") looks and feels pretty much like a regular Snickers, though it's less chewy without the caramel. (Side note: You can't taste the caramel in a regular Snickers. FACT.) That's fine–we're not having a texture contest here. The problem, though: It tastes pretty much exactly like a regular Snickers. At least the Snickers Dark, for all of its failings, was a little different. With this one, I'm suspicious that they just had some extra red ink at the printing plant and decided to do something with it. Either that or some meddling test audiences were scared by the idea of something different, and forced a totally groundbreaking candy artist to dumb down his or her masterpiece. Probably that didn't happen, though. Office reactions: "It's a little peanuttier than a normal Snickers, and it doesn't leave that stretchy caramel trail between the candy and your teeth, and then usually on your shirt. I actually like the texture of this better, but the taste isn't that different," "The nut-n-butter version kind of dissolves in your mouth, like those meltaway candies. It isn't nearly as chewy as normal Snickers. It's like Snickers for people too lazy to even chew," "If I hadn't seen the packaging, I probably would've thought I had just stumbled upon a slightly better-than-average Snickers," "To me, it's just a Twix without the cookie crunch. And much less chewy." Where To Get It: Target. The gas station. eBay in five years.